Are You Leading If You’re Going in the Wrong Direction? Bonnie here: Have you ever gotten jazzed up listening to an executive talk about what a project or program is going to do for the company? Big things, I tell you! This project is going to jet-fuel the organization! Go team! Then, you’re tapped to manage the project. As the excitement wears off, the realization dawns that you have NO IDEA what the project is really supposed to do. Precise Leadership, a presentation by Executive Leadership Group at the 2012 PMI Mile Hi Spring Symposium, talked about how project managers can be successful by bringing clarity to a project. The emphasis of this approach is on uncovering the big picture of the project. The first step is to understand the purpose of the project or program. That makes sense. But, in many instances, executives toss out vague goals cloaked in stimulating words, followed immediately by the directive “Get going!” Then, they revel in the warm fuzzy feeling they get watching the burst of activity that ensues. You probably know how that will end. What you need are clear results that the endeavor is supposed to deliver. Results-based philanthropy was one example provided by the presenters, Wendi Peck and Bill Casey. Instead of a goal of raising as much money for a charity as possible, results-based philanthropy starts by identifying a desired result, raises the money for that result, and then uses the money to achieve the result. Teresa mentioned that the grants she goes after for the nonprofit library system in her area want to know the results or outcome of the project that would be funded by the grant. Knowing the desired results delivers all sorts of benefits. The focus is on achieving results. That focus elevates everyone’s perspective to a more strategic level. Racking up hours or expenditures doesn’t mean squat if you aren’t getting closer to the desired results. In addition, you can prevent scope creep, because it’s easier to determine whether work supports the results. Team members understand why they’re doing work so they can be creative in how they achieve results. They’re also accountable for those results, so executives don’t need to micro-manage. Now, you have a list of results to achieve. Everyone’s feeling pretty good. But you burst their balloon by asking “What is the right result?” Stephen Covey shares my favorite example of the importance of this question in 7 Habits of Highly Effective People. Someone looks up from their work and says “We’re going the wrong way!” The response is “Shut up! We’re making great progress!” You might run the most efficient project and deliver every result, but if the original goal was off the mark, the project will be a failure. I liked the presenters’ take on the right result: a sweet spot somewhere between what you do and your lofty ideals. For example, doctors do physical exams. At the same time, they’re lofty ideal may be to make people healthy. The right result might be the middle ground of helping people make informed healthcare decisions. The third step is to identify success in such a way that the results are indisputable. The bad news: The simplicity of an indisputable result is inversely proportional to the amount of thinking and discussion required. Is your desired result to decrease the cost of customer support by 10 percent, shorten calls to an average of less than 5 minutes, reduce average wait time to less than 4 minutes, or increase customer retention by 25 percent? Another challenge: you don’t want to saddle the organization with bureaucratic procedures for measuring those results. Finally, you need to define some restrictions on those indisputable results. Some people are known for delivering exactly what you ask for, not what you intended. That is, if they can find a way to weasel around a result, they will. For example, if you’re trying to reduce customer service costs, you might want to specify that the results are achieved without a decrease in customer satisfaction. In most cases, 1 to 3 restrictions suffice to protect the results. A test that the presenters recommend is to ask whether taking a restriction off the list makes the result easier to achieve. If the answer is yes, the restriction is probably warranted. Learn more about some aspects of leadership in Your Project Management Coach. Chapter 3, “Getting a Project Off the Ground” talks about articulating a project goal and defining success criteria. Talk back: Think about a project you’re involved with. Do you know what the results are for that project? Are they the right results? Do you know how you will prove that you’ve achieved them? Do you need any restrictions to ensure that you truly achieve the desired results? 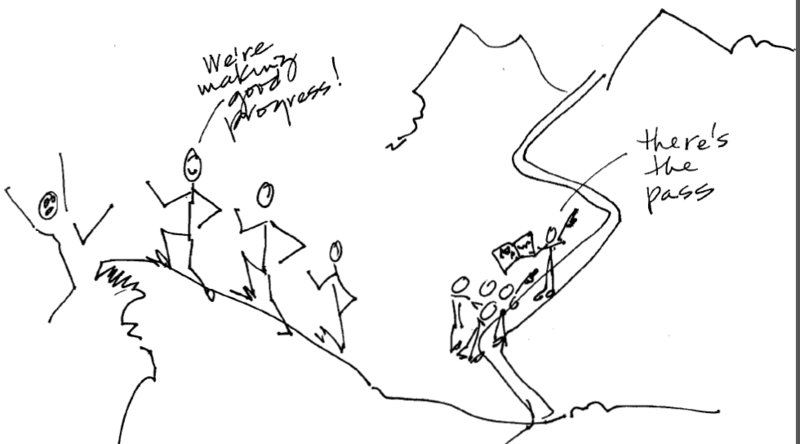 Love the observation: We’re going the wrong way! Shut up. We’re making great progress.